I was thrilled to discover another Indian paleo blogger recently — Ashley at My Heart Beets. 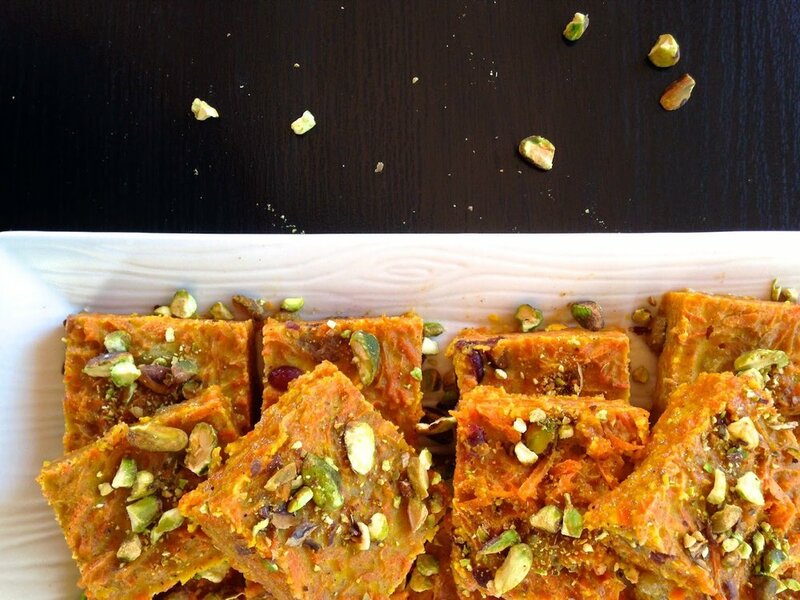 She's got a whole archive of awesome recipes that I can't wait to try (hello, NAAN), but I decided to start with this easy (and traditionally super-sweet) carrot halwa dessert for an Indian dinner party I had a while back. I made only a few tweaks to this sweet treat, and here's how it went down. Using a big Dutch oven-style pot, sauté‎ the carrots in ghee over medium heat for about 10 minutes. Then add the coconut milk and simmer for 20 minutes, stirring frequently. Add the cardamom, honey and raisins, and then continue simmering until the coconut milk cooks waaaaay down. This process takes quite a while, but it's mostly passive so I spent that time prepping dinner ingredients. Once it's cooked down, you can eat it as a hot pudding (that's what I actually preferred!) or cool it into fudgy bars like these photos. My bars didn't stay in fudge-form for long out of the fridge, which is why I preferred the leftovers as a warm pudding. You could substitute the cardamom for cinnamon, clove, ginger, etc. and create a totally different flavor of halwa. I served this at a party with Goan Fish Curry as the main course, plus a few other things I'll post soon! Anybody have any other great Indian paleo recipes I should try?